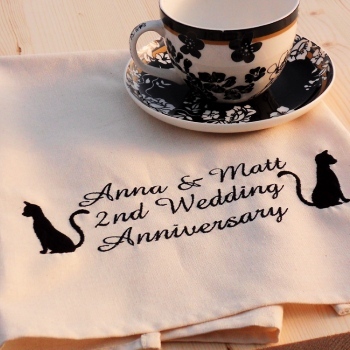 Bespoke embroidered tea towel featuring black cat silhouettes and a name personalised in between. Just fill in the option boxes and choose what colour embroidery thread you would like for the text, the cat silhouettes are sewn in black. Enter the names or words you would like sewn. We use natural cotton tea towels with a weave which makes them very absorbent. Hemmed on all the sides. 52 x 72cm You can select from a white cotton towel, natural beige cotton towel or a cream of the crop white linen tea towel. Personalised gifts are custom made to order - usually within 2-3 days.